There are so many sensitivities or allergies that people are diagnosed with: gluten sensitivity, peanut allergy, bee sting allergy, just to name a few. Have you ever heard of an extreme sensitivity to the sunlight that is often fatal? 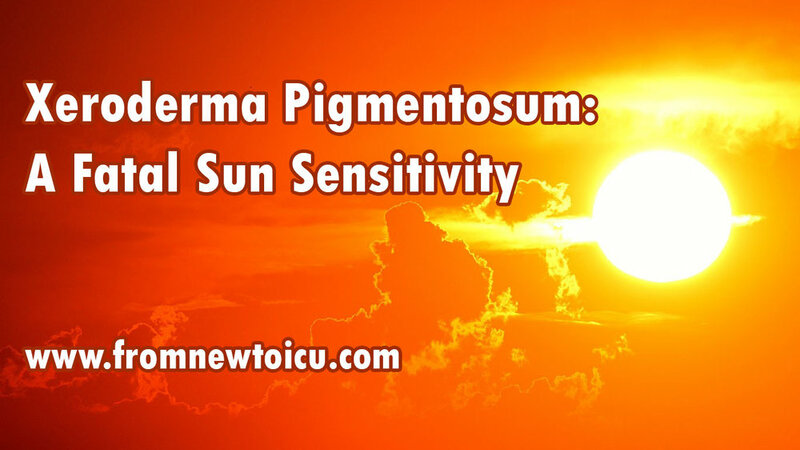 Xeroderma Pigmentosum (XP) is a rare skin disorder in which individuals have a very extreme hypersensitivity to UV light making it impossible for them to spend time in the sunlight. This condition affects 1 in every 250,000 individuals worldwide. Individuals with XP have a defect in the DNA repair system (specifically an impaired nucleotide excision repair (NER) system) which results in cellular hypersensitivity to sunlight. These individuals have premature skin aging and are at extremely high risk for developing skin cancer. It is most commonly found in Japanese individuals. Freckles. Babies and toddlers begin to develop freckles on areas that are commonly exposed to the sunlight such as face, arms, and legs. These may decrease during the winter months. Blisters. Many individuals also develop painful blisters sometimes immediately after exposure to the sunlight. Pigmentation Changes. Individuals can develop either very dark pigmentation (hyperpigmentation) or a lack of pigmenation in the skin altogether (hypopigmentation). Skin Cancer. Cancer can develop by age 4-5 with a average age of 8 years old. Common types of skin cancer include melanoma, basal cell carcinoma, and squamous cell carcinoma. Vision abnormalities. Changes to the eyes and vision include light sensitivity, cloudy lenses, swelling, inward or outward protrusion of eyelids, and blindness. Neurological issues. Common neurological conditions include motor delays, absent reflexes, developmental delays, weakness, and poor body control. 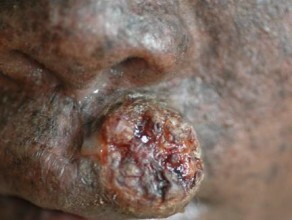 Squamous cell carcinoma of the upper lip. *Images courtesy of Regional Dermatology Training Centre, Tanzania via DermNet NZ. There are eight different subtypes of XP that are all inherited conditions. Seven of the eight are autosomal recessive genes meaning that both parents were carriers of XP but did not show signs of it themselves. When they had a child, both of the recessive genes were passed down and the child then developed the disease. The last subtype is autosomal dominant which means that only one parent needs to be a carrier of the gene in order for their child to develop XP. A factor that can increase the risk of developing this defect is if both parents are closely related (i.e. siblings or cousins). If parents share a genetic background then children have an increased chance of developing XP. Determining if someone has XP can be a lengthy process. Usually medical providers rule out other conditions first before testing for XP because of how rare this condition is. Providers will take a history, perform a physical, discuss symptoms, and do genetic testing to see if the individual has XP. There is no known cure for XP. There are clinical trials in progress to try and develop a treatment. Currently, individuals with XP need to minimize their exposure to the sunlight. If going outside, they need to make sure as much skin is covered with clothing or some covering. In addition to this, they must wear wide brimmed hats, sunscreen, protective eye wear, and minimize the amount of time that is spent in the sunlight. UV rays can also go through windows, so proper window coverings must be utilized. Individuals should have routine skin and eye exams performed. This will enable the individual to monitor the status of any abnormalities that may develop before extreme damage occurs. Many individuals die at an early age usually due to skin cancer. If early detection occurs and the individual takes the necessary precautions, they usually live to be middle aged. Newer:Alcohol Withdrawal and Delirium Tremens ManagementOlder:Looking for the Perfect Nursing Report Sheet?